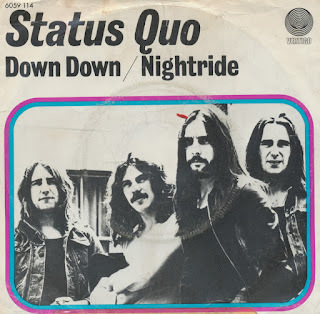 There are a few songs that are obvious candidates for a funeral: 'Shake your body down to the ground' and Status Quo's 'Down down'. I didn't have the latter yet, so I was glad to finally find a copy recently. Written by Francis Rossi and Bob Young and produced by Status Quo, it was Status Quo's only number 1 single in the UK singles chart. The single spent a week at the top of the chart in January 1975. The album version lasts 5 minutes and 24 seconds and the single version 3 minutes and 49 seconds.